On Friday 3rd March (2017), author Mike Revell officially opened our wonderful new library. Mike talked about the books that inspired him to become both an avid reader and a writer. Mrs. Peach, Mr. Butterworth (Governor with responsibility for reading), Mrs. Threlfall (from Knowsley’s School Library Service) and Mr. Kynaston were present. The opening ceremony was also attended by representatives from each class and the Y5 and Y6 librarians. We have an amazing team of librarians ! Our school librarians are Y6 members of our Y5 & Y6 Book Club. They are on duty before school and at lunch times. They process new books, monitor current stock and keep the library well organised so that classes may enjoy their weekly visits. Sam, Isabella, Zara, Dominic, Ruby, Lydia, Sinethi, Grace, Emily, Raffaele, Phoebe & Claudia. The commission from recent Book Fairs has been used to add lots of new fiction titles to the library. 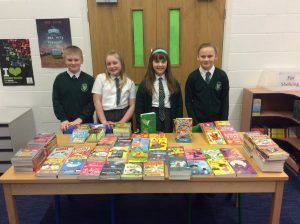 We continue to invest the money raised during last year’s ‘Are You Ready To Read ?’ sponsored event. 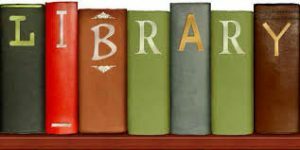 During the October half term holiday (2017), a selection of brand new fiction and non-fiction books have been added to the library.